Frances Garcia (@makeupbyfrances) has done it again. 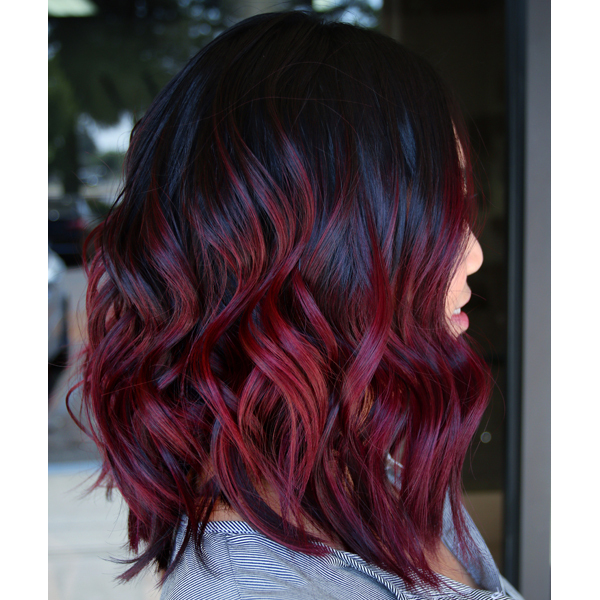 Not only did the 2017 #ONESHOT winner slay the hair game with this sultry cabernet formula, but this look received nearly 30k likes when we reposted it to our Insta! Dying to know how she did it? We got you. “I lightened this client’s hair with Level 7/8 babylights about 3 months ago, so I worked off the outgrowth from her last appointment,” shares Frances. Here’s what she did. 1. Apply Formula A from the midlengths to the ends and process for 45 minutes. 2. Shampoo, towel-dry then gloss over her whole head with Formula B for a little more color kick. Process for 15 minutes. 3. Rinse with cold water, apply Kenra Platinum Blow-Dry Spray and blow-dry. 4. Then, create loose waves with a 1-inch Bio Ionic curling iron and finish with Wella EIMI Glam Mist.